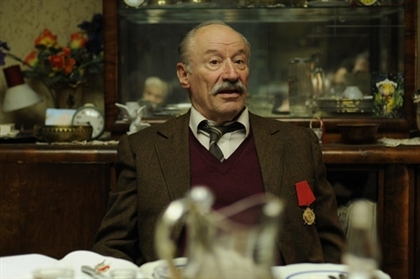 One day Ion, a 75-year-old man (played by the prolific actor Victor Rebengiuc), accidentally receives a Medal of Honour for some "heroic" actions back in WW2, times he barely remembers. The medal forces Ion to reconsider his whole life. Maybe he wasn’t all the time just a loser. Maybe his life has a meaning. Maybe he means something to his family. Full of irony, humour and meaning, this film is a real treat. VICTOR REBENGIUC is one of the most distinguished Romanian stage and screen actors, a real acting legend with a career spanning more than 50 years. In 1957, he made his debut as a member of the famous Bulandra Theatre company, acting in more than 200 roles on that stage alone. With his breakthrough performance in Liviu Ciulei’s The Forest of the Hanged (Pădurea spânzuraților) Rebengiuc became a major figure in Romanian cinema, idolised for his 1986 appearance in Stere Gulea’s Moromeții. He has also starred in films by Dan Pița (Tănase Scatiu; Sand Cliffs - Faleze de nisip) and Lucian Pintilie (Carnival Scenes - De ce trag clopotele, Mitică? ; The Oak - Balanța; Too Late - Prea târziu; Last Stop Paradise - Terminus paradis; Niki and Flo - Niki Ardelean, colonel în rezervă; Tertium non datur). Victor Rebengiuc has worked with all the greats of Romanian cinematography while also working for younger directors such as Cristi Puiu, Radu Muntean, Lucian Georgescu, or Călin Peter Netzer.